The Japan Central Bank caught the market by surprise last week when they decided to embark on a negative interest rate policy (NIRP) and lower short-term deposit rates below zero. This is just another step in a series of steps that they have taken in their pursuit to re-inflate the economy. The action setoff a relief rally in risk-assets since the market is accustomed to interpreting loose monetary policy as bullish for asset prices. Indeed, recent history would support this notion. Central bank policy has been beneficial for asset prices. The benefits for the economy are much more debatable. Monetary policy in Japan will only be effective in so much as it changes the mindset and spending and lending habits of consumers and banks. Let’s take a cursory look at NIRP and what it means for Japan, and whether or not we are likely to see similar Fed actions here in the United States. NIRP in Japan, despite the apocalyptic treatment that the press has given it, is largely symbolic. First, they lowered the interest rate on additional excess reserves at the Bank of Japan (BOJ) by a mere 20 bps. Second, the excess reserves already at the BOJ are effectively grandfathered in at the previous rate of .1%. The required reserve rate will be 0%. So, what has the BOJ done? Effectively, all they have done is incentivize Banks to lend at the margin, since they will still be earning interest on existing reserves. There has been a correlation (like in the U.S.) with excess reserves and Quantitative Easing (QE). As a result, the BOJ is trying to stem the increase of excess reserves as they continue their QE program. The efficacy of this policy remains to be seen, but QE may be more effective in conjunction with a marginal NIRP policy. U.S. QE did much for asset prices, but very little of that money (if any) actually found its way into the real economy, since excess reserves increased incrementally with Fed purchases. A much more aggressive policy stance by the BOJ would be to implement NIRP on all excess reserves, forcing banks to stop sitting on cash, but it seems the BOJ opted for a more prudent strategy since they are already in unchartered territory. NIRP, again, just like all of the other monetary machinations produced by the Japanese government and the BOJ, is simply a continuation of policy to stave off the deflation that has become entrenched in Japanese society. They have lowered rates. They have embarked on unprecedented QE, and the government has even raised sales taxes to increase consumer prices. This action is particularly curious since higher taxes usually crimp aggregate demand. It just speaks to the nature of Abenomics and the goal to reflate at all costs, even if it means lowering aggregate demand in the short-run. They have done this because they realize that monetary policy and the yield curve are ineffective at stimulating the economy if bankers are unwilling to lend, and consumers are unwilling to spend. Why is deflation so horrendous for economies and why does it result in the sterilization of monetary policy? The answer is quite simple. First, consumers begin to hold-off on purchases because they assume that the price of goods will be less in the future. This crimps demand and continues the vicious cycle of declining prices. Also, why would anyone finance large purchases knowing that the value their loan is only going to increase in terms of purchasing power? They wouldn’t. This is the problem that the BOJ faces. Deflation is a mind-set and they need to change the psychology of their consumers, and their lenders. ZIRP, QE, sales tax hikes, and now NIRP are all designed to change the psychology of consumers and stop the cycle of deflation. Those that have followed my previous perspective pieces know that I place great emphasis on wage growth as a causal factor for inflation. 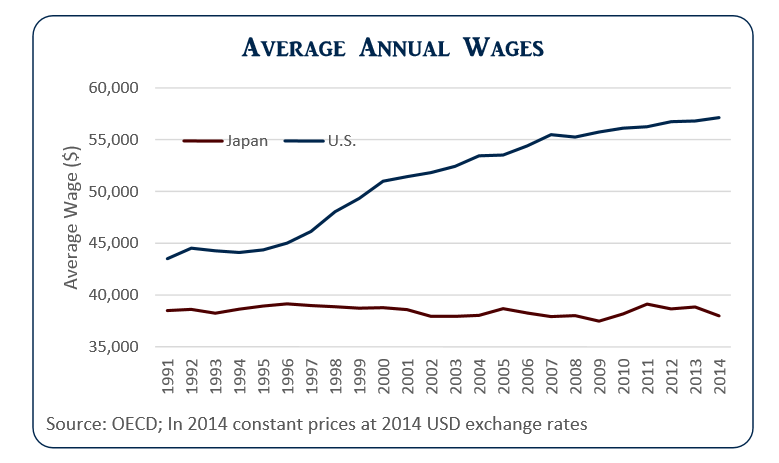 The below chart tracks the average annual wages for workers in United States and Japan from 1991 to the present. The data is the average, rather than the median that is so often quoted in the news. I find this pertinent since my point is not to illuminate income inequality in the United States, but rather to assess the real economic effects of income on prices. Since I know there will be questions regarding this data, the methodology of the OECD is below. “This dataset contains data on average annual wages per full-time and full-year equivalent employee in the total economy. Average annual wages per full-time equivalent dependent employee are obtained by dividing the national-accounts-based total wage bill by the average number of employees in the total economy, which is then multiplied by the ratio of average usual weekly hours per full-time employee to average usually weekly hours for all employees.” As you can see, the divergence is glaring. Since 1991, the average U.S. annual wage is up over 31% and the average Japanese annual wage is down over 1%. Perhaps more importantly, Japan had experienced negative wage growth for almost ten-years before the onset of deflation in 1999. Economists, workers, and the press may be dismayed by the rate of U.S. wage growth over the last twenty years, but in relation to Japan, there really is no comparison. Wages in the United States are rising, perhaps more slowly than we would like, however, they are still rising. 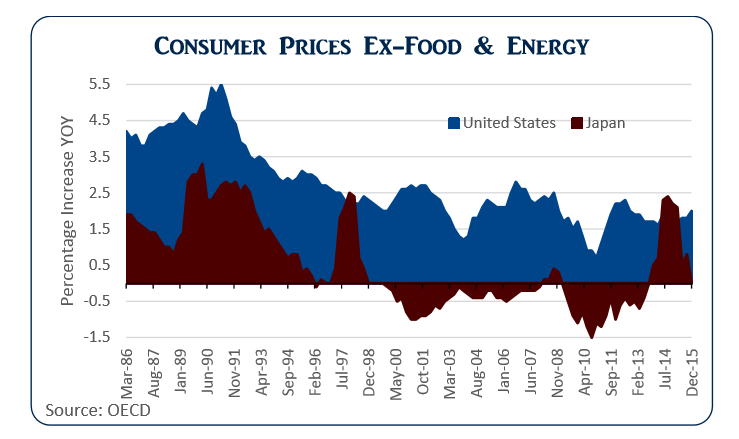 And if Japan is used as a reference, it would take a reversal of this trend for the next decade to change the U.S. consumer’s psychology to one focused on deflation. Again, the U.S. is not Japan. And following in their footsteps would entail wage stagnation for the next decade. Not impossible, but also not probable. Another result of deflationary psychology is the contraction of credit. Low aggregate demand and economic stagnation not only diminishes the willingness of lenders to extend credit, but it also diminishes the consumer’s demand to take on debt. After all, why borrow money for current expenditures when the costs next year are going to be lower. More importantly, why take out debt when that debt will be more onerous down the road, especially if incomes are stagnant or falling. The chart below illustrates the dichotomy of credit market efficacy in the United States and Japan. It tracks credit to both consumer and institutions in both the U.S. and Japan from the turn of the century until today. 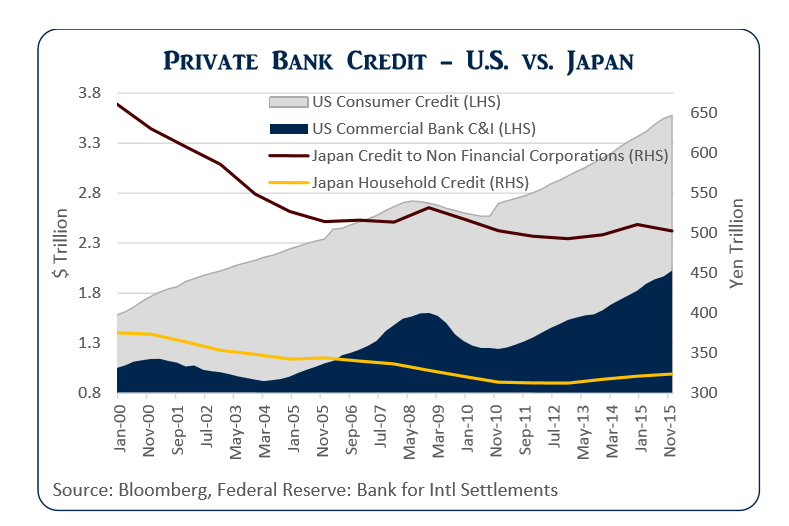 Simply put, credit in the U.S. is increasing and credit in Japan is decreasing. Commercial and Industrial loans from commercial banks in the United States have increased 98% since 2000. Credit to non-financial corporations in Japan has decreased 24%. Consumer Credit in the U.S. has increased 130% in that time period. Household credit in Japan has decreased 14%. This data shows that the credit market in the U.S., in spite of brief periods of decline, has and continues to recover from deleterious exogenous shocks (i.e. the tech bubble, and housing collapse). Japan’s credit markets have not displayed such convalescence. The reasons for this are many, and not the focus of this paper, but include the aggressiveness of the Federal Reserve in response to exogenous shocks and the quick purge of the U.S. banking system following those shocks. History has shown that such action in the financial sector is an important step in economic recovery, and preventing deflationary expectations from embedding themselves in mainstream society. There is a growing echo among investors that the U.S. yield curve is not a good forward prognostication tool for recession. I agree that we are in unchartered territory with regard to ZIRP. However, I think that pundits are too quick to dismiss a forward-looking indicator that has predicted every recession over the last century. 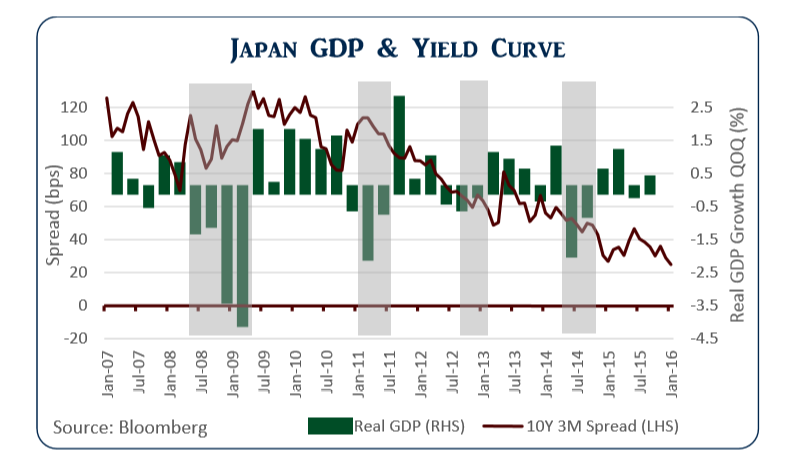 The basis of their contention is that because the inverted yield curve has not worked as a recession predictor in Japan, it will not work here in the United States. As you can see in the chart above, the Japanese yield curve has remained upward sloping (as measured by the difference between 3-month and ten-year rates) in all of the past four recessions. The difference between the United States and Japan, as I have tried to illustrate, is the existence of a functioning banking system and credit market. These persist because of the absence of deflation due to positive wage growth. It makes sense that monetary policy will not be a successful tool to stimulate the economy if lending markets are not operating properly. After all, what good is lowering short term rates, if banks are not willing to lend, and consumers are not willing to borrow? Furthermore, what good is a steep yield curve and the prospect of high Net Interest Margins for banks if there is no demand for credit? This is the problem that the BOJ faces. Until they can change the psychology of the Japanese people, monetary policy will remain ineffective. Here in the United States, where deflationary psychology is not ingrained, and where credit demand remains intact, the yield curve is still very much relevant. The US and Japanese consumer are psychologically different. U.S. wages have not stagnated as they have in Japan, and they have not had to endure the decade of falling prices that Japan has. Credit is still in demand, and as a result, monetary policy has much more of an effect in the United States than in Japan. Deflationary expectations will have to become ingrained in U.S. consumer psychology before we can follow in the footsteps of Japan, and if that happens, it will take a long time.